Jerrard Randall has looked solid as a backup quarterback for U of A. 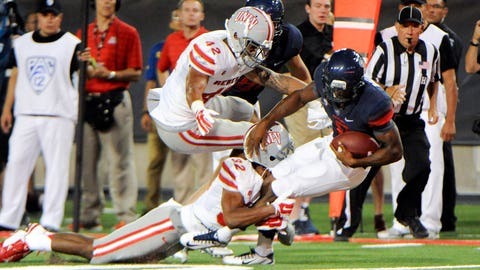 When Arizona lost to UCLA on Saturday, they also lost starting quarterback Anu Solomon to concussion. Backup Jerrard Randall, on his first touch, scored a 39-yard touchdown. He also scored a 57-yard touchdown vs. Nevada, on his first play of the season. He scored touchdowns on 72 and 73 yard runs vs. NAU as well. His ability to make plays has been nothing short of lethal with the time he's had on the field. Solomon, a sophomore, is the starting quarterback for the Wildcats and a much more accurate thrower. But senior Randall — once rated higher than both Johnny Manziel and Marcus Mariota coming out of high school — has potential to shine with the opportunity he's been given.